In part of a continued introspection as both a human and Black man from West Philadelphia I offer this analysis of the doing and undoing, learned behaviors of the male ego, love, creativity, vulnerability and happiness. The phrases “toxic” or “hyper” masculinity are now used to describe characteristics I once revered simply as Man Law: A collective consciousness of rules, parameters and behaviors that have been taught and reinforced from generations, born out of a white patriarchal society which leaves little room for expression of love and often individuality. As Black men, when our masculinity is a topic of discussion, we immediately hit the panic button and fall into our default defensive stances. Through my work I’m actively and continuously searching ways to express the pros and cons of masculinity to pose an unshackled perspective. The expression of brotherhood I witnessed while visiting Cuba for the first time was noticeably much gentler and embracive than what I was taught in both my home and on the corners of West Philadelphia. For example, a common male greeting in Cuba was a display of a full two-armed hug, followed by a kiss on the cheek versus a very firmly gripped or even creative squad handshakes; the combination of a handshake and one armed hug or even sometimes a two handed, full embraced hug with a loud two, three or four pats on the back by brothers in the States. Although both were rituals where men expressed love in greeting one another that were noticeably different yet they were not singular, the Cuban brotherhood was more intimate. After several failed romantic relationships as a result of ego, heated debates with Black women discussing their disappointment with Black men; I began analyzing pop culture, art and media and by discovering literature, I came to better understanding of perspectives and truths about how defensive acts surrounding Black bodies (a direct result of slavery, colonization and systemic racism) has created a pervasive dark cloud that plagues Black women. The LGBTQ community (groups who, because of Man Law --are seen as the lesser, and not to be considered part of the conversation; and has emotionally crippled a large majority of Black men)Men with heightened defense mechanisms, lack of non-sexual intimacy, decoded love and lack of self-awareness, who are teaching the same lessons and perpetuating fears to generations that follow. Our defenses when played back sound childlike but are rooted in misunderstanding. To be clear this is not a means to dethrone or remove myself from masculinity but to take off the shackles of sameness and showcase that these characteristics are not law and that vulnerability is a powerful human experience. As I start to examine my actions toward other humans, I notice my own fallacies while uncovering and appreciating the hidden layers of unspoken sensitivity inside manhood in my communities and want to add my own perspective to the spectrum of masculinity. The barbershop is the cornerstone of the Black male experience and universally known as the place to catch-up and/or assert your opinion on sports, politics and pop culture, but a closer look it’s also where the transformation and the beautification processes of Men that’s been initiated in our youth. Contrary to popular American opinion, men desire to feel “handsome”, the masculine form of beautiful, and in Cuba other than the size and condition of the barbershop the revelations were identical to the ones I was initiated in by my elders. In the Black and Latin communities these bi-weekly trips are essential to the representation of one’s personality, character and in certain scenarios can improve one's social status. Our confidence and esteem rely on trust and vulnerability that we place into the hands of another man, our barber. Trusting in another man’s precision and skill, allowing close physical contact to the head and face in order to give one the satisfaction of feeling fresh and complete, are the tenants of our beautification. A hidden level on sensitivity. With shop conversations ranging from women’s behavior, expectations and male beauty standards it serves as both a breeding ground for toxic reinforcement and a collective consciousness as well as male initiation, beautification and healthy respect for craftsmanship. It is indeed a place where men can be vulnerable. 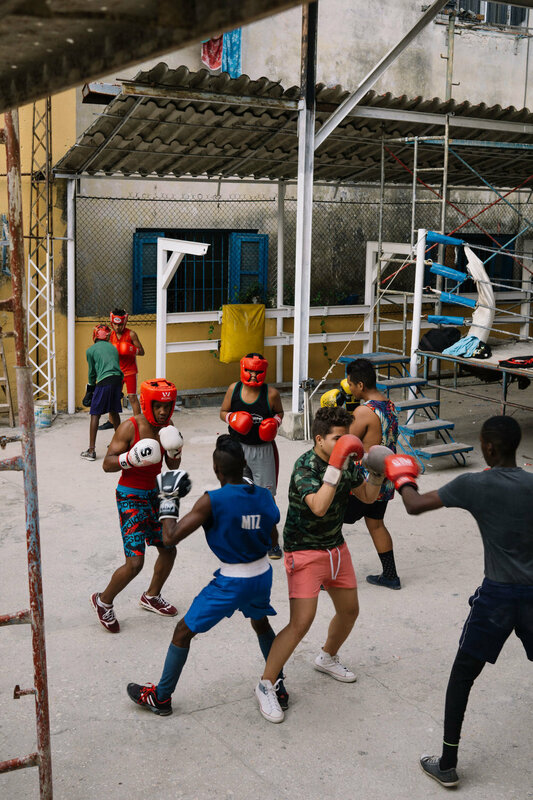 At the boxing ring in Old Havana, there was a moment when a boy in a camo printed shirt injured his wrist, and there was an overhaul of emotional support from the fellow boxers and coaches that I’ve never seen in any boxing gym, basketball courts or any other sport institutions in America. The gentle, loving behavior and reassurance I witnessed has left me with an altered impression of the two sides of a warrior; one who can exhibit supreme strength and ferocity and on the other side generosity and love. Even in a sport known for its brutality, in Cuba there was an equally intense level of care and embrace. During the sparing a fighter in red shorts hurt his wrist by throwing an incorrect jab. One of the younger and smaller fighters came over to give him a hug and I was stunned that it wasn’t met with commentary from the other fighters that he was “too soft!” I felt both ignorant and blessed to have witness such a beautiful moment of humanity. While on the other side there was the fighter in blue shorts and top, was complaining that he wanted to take a break because of a body shot taken to the stomach. In his moment of pain, he refused to fight and started to walk away from the training area with disinterest. Because he wasn’t showing any signs of excruciating pain and able to continue, he was aggressively ordered to FIGHT! This is vital because it’s a training technique to separate your mind from pain, use your defense to never expose to your opponent your weaknesses to exploit or everything you’ve trained for can and will be lost. After seeing the treatment of pain of the two boys by their fellow warriors I witnessed that manhood does not become stronger by disregarding vulnerability but acknowledging and assessing when to reintroduce sensitivity or reinforce strength. While cleaning off the mirror to show the world itself, I looked into it and finally saw myself. Suppressing vulnerability has created a hardened delusion that not only forces men to mask their vulnerability with anger as a means of survival but also devalues the power of vulnerability. While there are universal signifiers for masculinity, manhood and brotherhood, I believe as men it is our responsibility to strengthen our bond and human experience by paying closer attention to our unique ways of showing love and work to eliminate the divisive teachings that created barriers and limit our expression.